Stay tuned this week for more details on the upcoming episode! Also worth mentioning: if you haven’t already played The Walking Dead400 Days DLC for Season One, well… let’s just say that’s something you might want to check out before this season continues! This sneak peak might seem too short and a mere reminder of the next episode’s arrival. The release date is indeed imminenet and it can happen at any time. However, considering the amount of precious information cointained in this screenshot, I think there’s more into it. In the previous episode, All That Remains, Clementine met a new group of survivors that skeptically took her in. 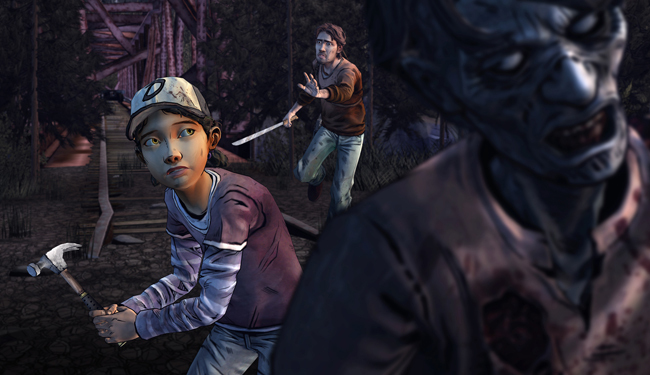 Clem had to prove herself multiple times and at the end of the episode, she was forced to make a though decision – save Nick or Pete. Regardless players’ decision, it seems the cabin group has future plans for Clementine. In this freshly released screenshot, the young girl is fighting walkers with one of the cabin members, Luke. I suppose this can only mean they either got forcefully separated from the group or they’ve got an important mission to accomplish. Either way, they seem to be on their own and in great trouble. The rudimentary weapons, a hammer and a medium blade, reveals that they either left the cabin in a rush or the group is really short on weaponry supplies. Anyway, could they be heading towards the mountains? The bridge in the scene seems to indicate that, especially because this is no ordinary bridge to cross waters. Lastly, Clementine’s expression indicates that she’s determined to achieve her goals, in this case, to take down all the walkers in her way. And Luke seems to be holding back, afraid to keep going or perhaps scared for Clem’s life? After all, it’s not everyday that you see a little girl slaying zombies in a post-apocalyptic scenario. I’m sure Telltale Games will introduce a new set of thrilling events coming up in the next episode. And eventually, we’ll find out how the past DLC is connected with the new story.